Read More Fireflight are Dawn Michele on lead vocals, Wendy Drennen on bass guitar, Justin Cox and Glenn Drennen on guitar with Phee Shorb on drums. The band became Fireflight back in 1999 when Justin and Glenn had gone to school together. Glenn had the idea to start a band with Justin and Wendy. The next part was to find a singer, which they found when Glenn and Wendy went to Glenn's younger brother's graduation and heard Dawn Michele sing during the service for it, they asked her to be in the group which she agreed. The band just needed a drummer, thankfully through a mutual friend they met Phee Shorb, who went on to become they drummer. For Those Who Wait is the fourth album from the band, following their 2002 independent release Glam-rok, 2006's The Healing of Harms and 2008's Unbreakable. 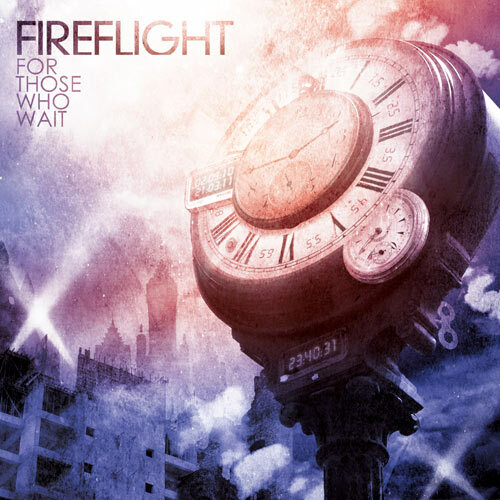 Now a decade on Fireflight release their latest offering. The obvious comparison of style and sound would be with Red and Skillet which are not my usual cup of tea. But to my surprise I really enjoyed the album. Vocals from Dawn Michele are sung with such character and bellicosity, yet without shouting and screaming, you can feel the joy, pain and worship within the songs. The album kicks in with title track For Those Who Wait which interwinds orchestral strings with hard rock guitars, done to very high standards. Up next is the album's single Desperate which powers in with an aggressive riff that can be heard all the way through the song. The perfect single choice from all the songs on this album. These two tracks show what Fireflight do best, crafting a radio-friendly snarling rock songs that you could see being sung as anthems in gigs. The majority of this album is track after track of hard rock anthems, which isn't everybody's cup of tea, but well worth a listen if you're into the heavier side of Christian music. The tracks that surprised me from the album are Name and the last track on the album Recovery Begins which show the softer side to the band. Name is a wonderful piano ballad and Recovery Begins is in the same vain, yet slightly darker and more atmospheric. Two wonderful tracks, showing a fascinating side to this band. If you like Christian music, a bit more aggressive, yet without shouting and screaming vocals, then maybe this could be an album for you. For me, it's not one I'll listen to a million of times, but has some wonderful moments and I was staggered at how much I enjoyed this album.